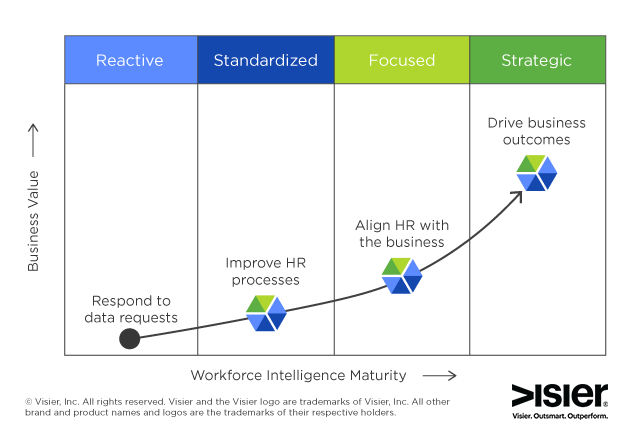 It's Time to Move Up the Workforce Intelligence Maturity Curve | Visier Inc. Maturity models have been so successful in breaking down the journey, intermediate goals, and steps to creating business impact that there is hardly a discipline or function without a model. They are particularly powerful in scenarios where the path to business impact is less obvious, and so we often see them in process-heavy or data-heavy disciplines. While workforce analytics and workforce planning are increasing in priority, most organizations have not progressed to take advantage of the opportunity that workforce data provides. Many that have graduated from metrics to analytics use it very simplistically, often to respond to one-off data requests such as “how many employees were hired last month?” or “how many people left from my department?” Once the reports are generated, they are rarely used again and the only process in place is to react to the next request. This provides little in efficiency and, more critically, little business impact that comes from connecting workforce data to business outcomes. Managing employee data, and turning it into business impact is, therefore, a perfect scenario for a maturity model. This is why HR’s new year resolution should be to move up the Workforce Intelligence Maturity Curve as quickly as possible. There is no one single activity that will move you up the maturity curve but, generally speaking, the journey up this curve requires moving from reporting on what’s happened in the workforce to continuously using past and present data to inform workforce decisions that drive business outcomes now and in the future. For HR to realize its full potential this year, it needs to accelerate its progress from the Reactive level to the Standardized, Focused, and ultimately, Strategic levels. As the Reactive name implies, the most common behavior at this level is to react to requests from users. Most of those requests take on the form of reports — listings of data — rather than provide any form of analysis that tries to uncover trends, seek out root causes, or provide some insight into why something is happening. Therefore, the decisions that follow from the use of such data are inherently operational. They are used to ensure Talent Acquisition adds positions to hire because of departures, or the Talent Management team follows up with whoever hasn’t completed their performance evaluations. Generally, spreadsheets will be the single tool where data is collected and sorted, and it will also be the same solution to share data. It is an insecure, unreliable, manual and cumbersome process. Compounding this, metrics are also non-standard: a common challenge at the Reactive level is the loss of time in meetings spent with stakeholders comparing numbers to try to determine whose number is right. Finally, due to the level of effort required, the value of such approaches is reduced. The most valuable questions are answered by connecting multiple systems of data: for example, connecting performance to compensation. 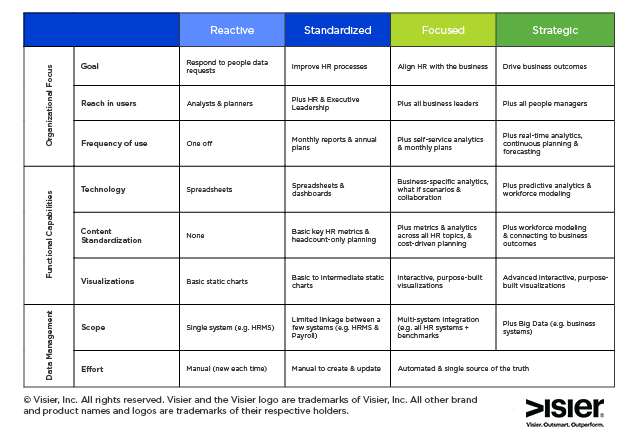 To progress from Level 1: Reactive to Level 2: Standardized, an organization typically invests in a dedicated analyst and/or planner position, and provides them with visualization and/or dashboarding toolsets that are built to solve many of the challenges of a manual and unreliable spreadsheet-based solution. Level 2 is the second most common level for organizations today. At this level, the focus is on improving HR processes by standardizing basic key HR metrics, and producing and sharing regular reports or dashboards across an audience of HR and executive leaders. Generally, workforce planning starts at this level as a mechanism to track required headcount, usually as part of either building hiring plans or controlling costs. 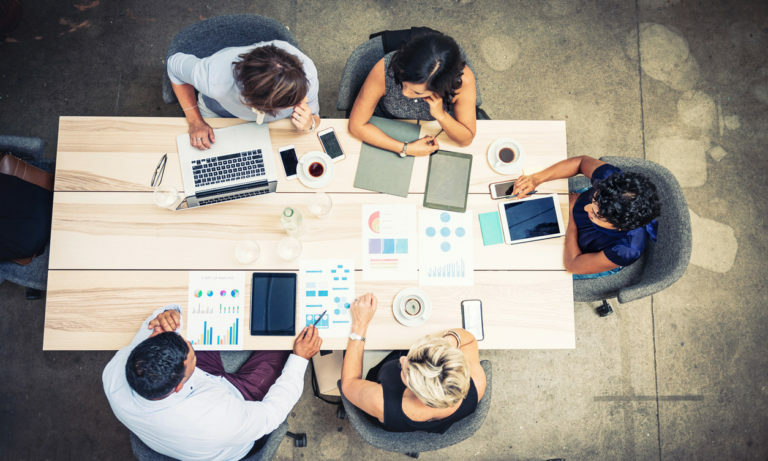 However, workforce plans are likely to be annual efforts created with little or no insight into historic workforce trends, no ability to model different scenarios, or to model changing aspects of the workforce such as costs. 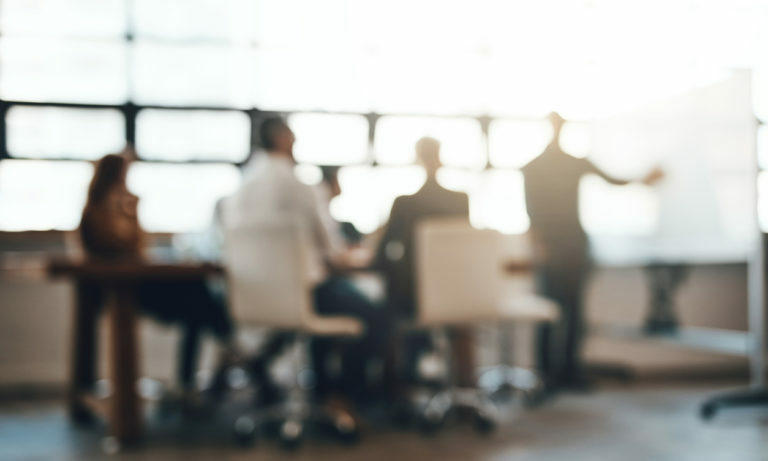 With efforts still largely manual, and likely relying on spreadsheets, plans are managed centrally with little collaboration across business leaders outside of the executive team. At the Standardized level, dashboards are a common addition to the organization’s analytic capabilities. Dedicated reports, which group and summarize information, become a common way to share information. However, visualizations remain static and do not allow for interaction with the data they contain to explore for further insights. 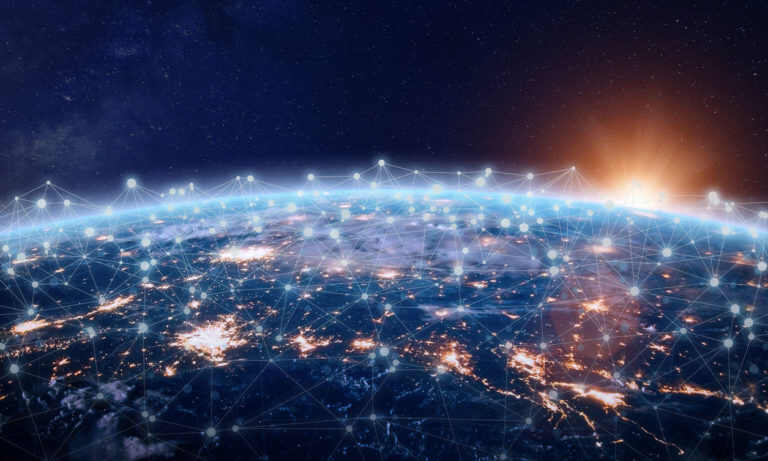 There may be connections between data from more than one HR system; however, this integration is performed manually and requires skilled data management resources. Although moving from Level 2 to 3 can be a significant effort, both technologically and organizationally, the rewards are great. At Level 3, the focus is on aligning HR with the business strategy and goals — a critical factor in ensuring HR provides strategic, not just administrative, value to the business. One of the core capabilities that sets the Focused level apart from Standardized is the self-service ability for users to answer their own questions. 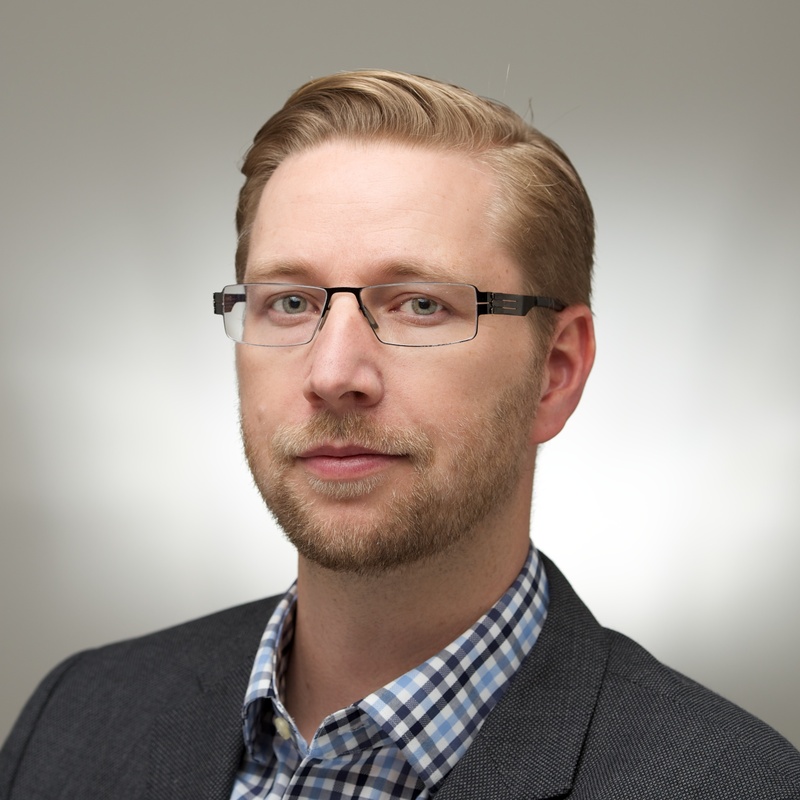 This is often paired with an investment in data scientists or other analytic resources in the HR organization that can tackle deeper questions that connect talent data to business outcomes. 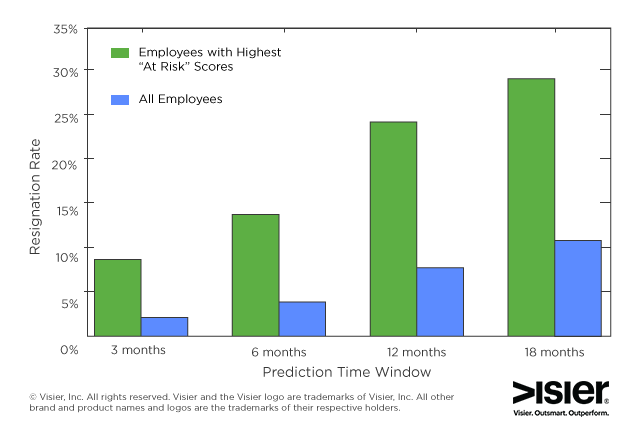 Too often, HR organizations try to skip too fast to predictive and data mining, and will find their highly skilled resources manually creating reports. The other core capability present at this level is an automated approach to the integration of data from multiple workforce systems. By, for example, connecting recruiting data to performance management data you can answer more powerful questions such as “what sources provide us with the highest quality talent?”. The automation of this work also helps to ensure highly skilled analytic resources can focus on more valuable workforce questions. Finally, Standardized organizations are also planning organizations. They make decisions about the future by applying insight they have gained from past trends, which is aligned across business stakeholders, and is evaluated against business goals. They recognize that the business environment, work environment, and workforce are constantly changing and so they evaluate plans and adjust them on a regular basis. The biggest error most organizations make in attempting to move to Level 3 and 4 is forgetting that mindsets and skillsets of the HR organization matter as much as the investments in technology. And this change starts straight from the top. The CHRO needs to take a mindset that, while opinions are nice, decisions happen when they are backed by data. Too often, workforce decisions are made with only short term considerations in mind. Strategic organizations are able to add in the additional capabilities and approach to connect decisions they are making today, to outcomes they desire next quarter, or next year. Through analysis they know what has happened, and through planning they have aligned on what they need to change. And the change aligns those decisions not only to HR outcomes they desire — such as increased engagement, reduced turnover, more effective recruiting — but also to business outcomes they desire: Increased customer satisfaction, higher margins, more revenue. The use of data aligns the organization on the actions they need to take. As you move through each level, build trust with leadership by showing how effective data-driven workforce decisions are. Executive buy-in will make the journey not only easier, but their support will be crucial to creating the data-driven culture needed in Level 3 and the strategic, fact-based mindset needed in Level 4.